"It's a slapstick, high-octane comedy, and, at the same time, its warnings for humanity and our survival are dire and profound." If you head to Boerum Hill right now, you'll find a most unusual sight: a gender-bent revival of the 1967 play, Little Murders, staged inside an old, abandoned burger restaurant. It's a lot to take in within one sentence, but for the cast and crew, this show is the product of several years of collaboration. Director Shira Milikowsky first staged the gender-bent iteration of the play in 2014 at Harvard University, in the midst of a wildly different political landscape. Now, three years later, she's brought back much of her same cast and creative team for a new staging in Brooklyn, presented in the context of a decidedly darker America. Little Murders is a dark comedy written by Jules Feiffer—it follows the story of the Newquist family, and, specifically, Patty Newquist, who brings a strange, somber man named Alfred home and announces him as her fiancee. What unfolds is a simultanesously funny and extremely violent tale that examines identity and cultural norms through a grim lens. Milikowsky's production is staged at what was formerly Burger on Smith in a limited engagement that runs through August 13. The cast includes rising New York actors Mark Mauriello, Andrew Barrett Cox, Liz Leimkuhler, Juliana Sass, Griffin Sharps, David Sheynberg, Dawn Clements, Michelle Martinelli, Hayley Moir, and Abraham Rebollo. (Tickets can be purchased, here). OUT sat down with the director to chat about how the project was conceived, the new context it's taken on thanks to Trump, and how Little Murders functions as a queer narrative. OUT: Why'd you decide upon this show in 2014, and why'd you decide to do it again now? Shira Milikowsky: I had read this play years and years earlier, and always remembered it as a "comedy that would be fun to do sometime." That's all. I was drawn to the character of Patsy and the way the play portrays her special combination of strength and vulnerability—really unusual for a comedy. When I re-read it in 2014—I think it had been about ten years since my first read—I was struck by a lot of the politics of it, and how they seemed to be coming back around to relevance, despite the 45+ years since the play had been written. Specifically in 2014 I was interested in the role of gun violence in the play—how it normalizes for the characters and becomes a part of their every day lives. In 2017, those politics have taken on an entirely different meaning. Or, not different, actually, but far expanded. Lines like, "I don't pay attention to facts or any of that nonsense anymore" were lines that we barely heard three years ago, and now obviously have a whole new resonance. Our experience of building this production has been a process of revealing more and more of those "hidden" aligning moments. That said, there's an artistic reason for doing this production right now: which is that I wanted to get back into the room with these particular actors, and suddenly we were all in New York at the same time, and the moment was upon us! Obviously, the times have changed in the past three years—how've you updated the show since you first staged it in 2014? It's more that the show updated itself. Things that were always in the script popped out at us in a whole new way. We actually started making fun of each other about this because it was happening so often in rehearsal. One actor would roll their eyes and look at me and say, "Now, more than ever, Shira?" And then we'd all laugh. And then we'd all cry. Because, yes, now more than ever! And, also, that is already a cliché. The other major change is that the last production was performed in a theater. And this is in an abandoned restaurant. And there is simply no accounting for how much that radically changes the audience's experience of the entire event! I didn't quite know the extent of that change until we were in the space, ourselves. Why an old burger restaurant? In our earlier production we conceived of the Newquist family as desperate squatters, obsessively clinging to a hetero-normative fantasy in order to cope with the urban dystopia around them. We thought that instead of setting the play in the time that it was written, we'd set it in some distant, horrible future, where these characters are playing at a "perfect 1960's sitcom family"—and that somehow they feel they must do that in order to survive. They're pretending that they live in the "typical Upper West Side" apartment that Mr. Feiffer describes in the stage directions, but they really live in a decrepit, abandoned space. And the play is about the gradual unraveling of that mutual group fantasy. In our first production, we built a set that looked like an abandoned space, and we put it on the stage in a beautiful theater. So this time around, we thought, let's move the Newquists into the house where they really live: Burger on Smith! What, specifically, prompted the gender-bent casting? Like all big artistic decisions, it was an intuitive, in-the-moment decision that turned out to unlock a lot of my suspicions about the play. I'd like to take credit for a sophisticated, pre-meditated insight, but it didn't go that way. Mark (who plays Marjorie, the mother) and Liz (who plays Carol, the father) were two young actors whom I knew from other projects. They both came in and auditioned and read for various parts. I remember thinking, "Oh well, there's no right part for either of these explosively talented performers." And on the spur of the moment, really the last minute of the day, I asked them to switch scripts and read Mark as Marjorie and Liz as Carol. After a long day of tiring auditions, suddenly the whole room was electric and everyone was laughing at all the jokes. It was theater magic. It was only later that I started to understand what that magical moment was about, and what it meant for the rest of our production. Little Murders is a great play of its time. And its time is fifty years ago. How we write, think and joke about gender has changed dramatically in that time (I mean, it's changed dramatically even in the past three years, let alone fifty years.) An honest production of this play has to address that gap. And I don't just mean that it's "outdated" - it's way more nuanced than that. Feiffer has incredible insights on gender and gender roles, and how we bump against stereotypes and then find ourselves craving the old structures, and then oppressed by them a minute later. The play raises more questions about gender than it answers. What I found was that by switching the gender of two of the leads, it provides the audience a certain amount of distance. We see the actor and the character, simultaneously but separately—and that distance helps us both experience the story and also think critically about what is being performed in front of us. How's this show speaking as a queer narrative before you and your team put your hands on it, and how have you queered it? Would I call it a queer narrative in its original form? I'm not sure. On its surface, there's a lot of troubling language in the play that we have worked hard to re-claim and, if I'm being honest, to straight-up mock. I guess you could say we reclaim it by mocking it, which feels appropriate to the play's own intentions. And yet there is something in the character of Patsy that opens the door for the queer narrative that we end up finding in the play: her headstrong refusal to conform and her insistence that despite being outside the norm, she still deserves all of life's joys and intends to get them. By the way, in a beautiful, sad moment of synchronicity, the role of Patsy was originated on Broadway in 1967 by none other than the recently departed, great Barbara Cook. We'll dedicate the rest of our run to her memory. As for our queering of it—we have taken that question of struggling against convention, and we've turned it on its head with our gender-bent casting. 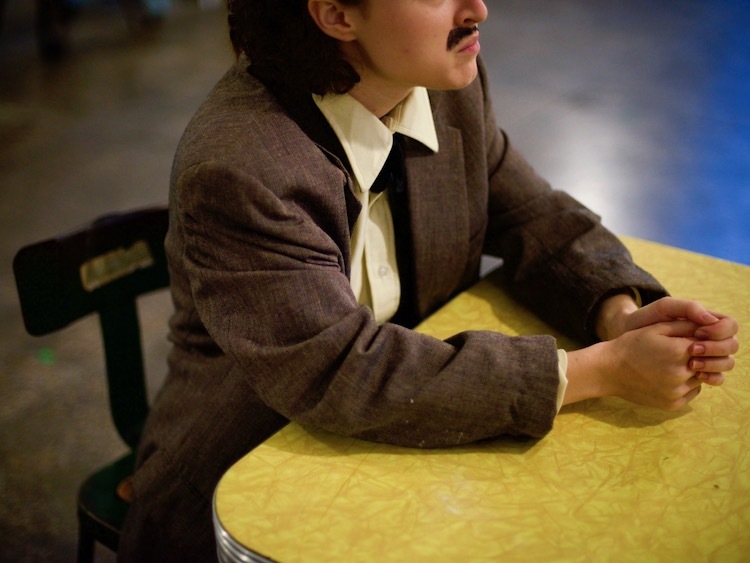 Even as Marjorie is the character pushing the conventional norms on everyone else in the play, she's also being played by a man in a dress, and her husband is played by a small woman with a drawn-on moustache. So from the moment the audience comes in, there are clear, loud signs that things here are not as straightforward as the characters want them to seem. And it is these characters' desperate fight to stay "normal" that will lead to their apolcayptic unraveling. What draws you to dark material? Well, I've led a pretty charmed and easy life, and somehow that meant that from early on I was drawn to the darkest material I could find. I'm sort of joking, but I am always looking for material that will reveal more and more of itself over the course of the process. I like to direct plays that seem like they mean one thing on day 1 of rehearsal, and then turn out to mean 500 more things by opening night. I end up directing a lot of comedy, because I believe laughter is primal (like music), and I think one of the reasons we go to the theater is to experience these kinds of primal sensations surrounded by a real-live group of real-live other people. Little Murders is one of the rare plays that satisfies both of those cravings: it's a slapstick, high-octane comedy, and, at the same time, its warnings for humanity and our survival are dire and profound.